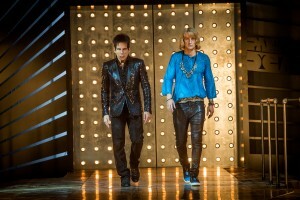 The 15-year gap between 2001’s “Zoolander” and this similarly silly sequel is addressed in a quick catch-up that gets points for aging the characters in real time, but which also adds melancholy to the mirth. The movie has several good gags, including a cleverly amusing revelation about what really went on in the Garden of Eden, but a lot of the fun here feels almost desperate. 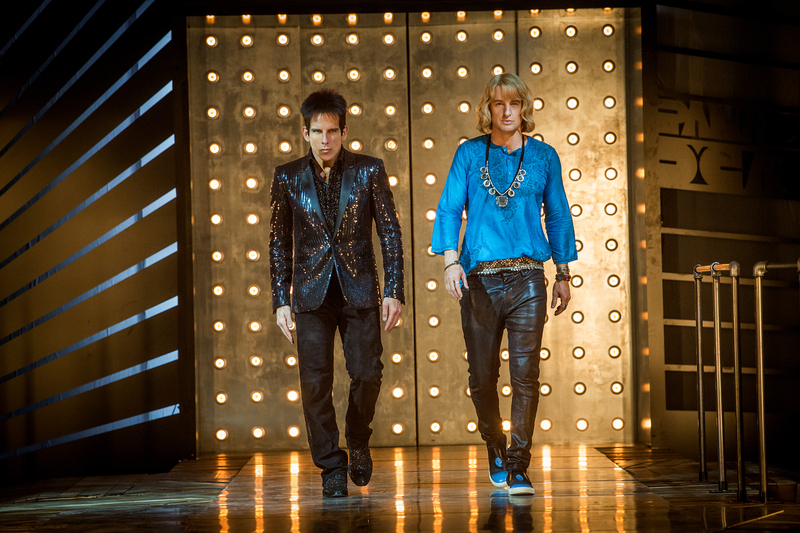 Last time around, the laughably self-involved Derek Zoolander (director/co-writer Ben Stiller) had to get back his male-model mojo after being surpassed at his craft by hot-new-thing Hansel (Owen Wilson). This year, both are humiliatingly out of fashion (at one point finding themselves wearing “Hi, My Name Is” badges that identify one as “Old” and the other as “Lame”) and in need of serious runway redemption. While the first installment undeniably had its own dark touches (three flamboyant characters literally go up in flames, and the central plot involves a “Manchurian Candidate”-style assassination attempt), this year’s model includes serial killings, an absurd but still awkward joke about miscarriage and a building collapse that kills Derek’s wife and leads to authorities taking away his young son. An invite from the severely speech-impaired fashion magnate Alexanya Atoz (Kristen Wiig, in demented Donatella Versace mode) gets the now-estranged Derek and Hansel back together in Rome. Scenes mocking their novelty-obsessed industry and Emperor’s-New-Clothes scenesters in general include an appearance by Benedict Cumberbatch as a no-eyebrows-and-Cher-hair model known as All who is “not defined by binary constructs,” and a hiply horrendous hotel known as Palazzo D’Caca that is constructed entirely of reclaimed human waste. Interpol Global Fashion Division Special Agent Valentina Valencia (the red-leather lovely Penélope Cruz) is investigating the murders of pop stars whose dying expressions all mysteriously resembled Derek’s signature Blue Steel look. As Hansel notes, “She’s hot. Trust her.” An archived black-and-white TV commercial she watches that features Derek as a half-man, half-cow centaur is one of the movie’s best bizarre bits. Derek’s teenage son Derek Jr. (Cyrus Arnold), lost to Derek for more than a decade and raised in an Italian orphanage, isn’t exactly what Dad expects when the two reunite. That makes for some opposites-repulse moments, but those things have a way of working themselves out in movies like this. Will Ferrell is back as the hilariously hyper-hostile designer Jacobim Mugatu, who was locked up for his “Zoolander” crimes in a prison resembling a giant thimble. His finest moment may be when he says that he can’t believe the rest of the cast actually believes his explanation of the supernatural circumstances leading to an elaborate human-sacrifice showdown. Cameos include several fashion designers who hope to achieve immortality based on more than their work, the abnormally fond of a baby hippo Willie Nelson, the big-secret-possessing Sting, and a “Rocky Horror Picture Show”-referencing Susan Sarandon. At one point, the cool-with-being-clueless Derek tells the similarly uninformed Hansel, “I miss not knowing things with you.” That kind of comfortably dumb humor keeps the movie likable, even if it no longer seems especially fashion-forward fresh.